A Saudi national who arrived in the U.S. in 2008 on a student visa has been convicted of attempting to use a weapon of mass destruction in Texas. 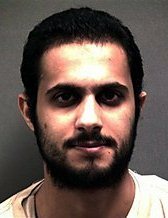 Khalid Ali-M Aldawsari, a former chemical engineering student at Texas Tech, was planning to use his skills to build a bomb, according to prosecutors. Although he had not definitively selected a target, Aldawsari allegedly researched of list of targets, including the Dallas home of a former president George W. Bush, nuclear power plants and former soldiers who were stationed at Abu Ghraib prison. Prosecutors also indicated that a college football game was a possible target as well. Authorities began their investigation into Aldawsari in February 2011 after a chemical supplier in North Carolina reported an unusual purchase made by Aldawsari. He was arrested within a month in Lubbock. A month later, he wrote in Arabic, “Muslims can not enjoy a carefree life and peace when in front of them and behind them their lands and dignities are being desecrated with the help of the Arab traitors and other Zionist rulers inside the Muslim world…” His Facebook profile lists “STOP Israel’s War Crimes in Gaza” as one of his interests.